It was a dark and stormy night…Actually it was a sunny morning and the first emails of the day were streaming in with dogs in area shelters that needed special hands on care. After several months of recovery with us, the last pup I helped was well healed and placed in his forever home. I was finally ready to start working with another needy angel. Once that word got out, the requests streamed in. One picture caught my eye. It was the saddest photo I had ever seen of an emaciated, badly wounded puppy. Within the hour I was in the car to get her. Her photo did no justice to the extent of her injuries. I won’t show what I saw that day on this site, but I will say I had never in person, seen such a wounded animal who was still surviving. She was so small and still, that when they placed her in my arms it barely felt I was holding anything. The shelter technician said he didn’t think she’d make it. Then as if in pure defiance towards his statement, she lifted her head and looked me straight in the eye. I could see her thinking, “just give me a chance, love me, give me care and I’ll show you they are all wrong.” Right then, I knew she was a fighter and survivor, and with that we were directly off to the vet. They wanted to do surgery immediately for her wounds and broken bones, but she was too small, weak and thin. She was hydrated, started on several medications and I was given the weekend to put some weight on her. It was late Thursday afternoon, the vet scheduled surgery for Monday, but he said it could only be done if I got her to gain a couple pounds. I really think she understood his words; her will to live and my Sicilian background with food went into overdrive. I named her Huntley; it’s beautifully feminine and very strong - just as she was the first moment I saw her. Huntley spent the weekend doing nothing but eating and sleeping. She inhaled pastas, rice, chicken and cheeses, but her favorite was carrots pureed with heavy cream. She was taking the vet's words to “gain weight” very seriously. This is not a diet I recommend for any dog, but come Monday she weighed in close to 3 lbs. heavier, nearly doubling her body weight. Her surgery was uneventful and a great success, just the way we like them to go. She spent the next two weeks on heavy medications; sleeping on my lap, in my arms, or in our bed. She ate anytime she was awake and worked very hard at recovering. At first it was a sleepy, sedated, slow road. Then, off all medications, Huntley proved her amazing will to heal by visible leaps and bounds. Our little girl was a true fighter. I swear she grew by the hour, and certainly got bigger overnight. I’d wake up next to a puppy that was larger, more energetic and healthier than the one I went to sleep next to. She had grown into a happy, healthy, thriving puppy. Once she broke into the bags of flour in the kitchen, and all I saw of her was a wet black nose among mounds of white flour, I knew she was really well, I also knew what was coming next – adoption time. She was ready for her forever family. It took no time for Karma Rescue to find her the perfect home. They were a family so loving, and had a home that was simply grand for her. She would get her own huge back yard, an active Mom and Dad, beach trips, loads of love, great commitment from her new guardians, and the promise of a furry brother to come. She and I did have our few days to say goodbye to all her “childhood” friends, both the two and four legged ones alike. Tears spilled in joy mostly, but also over the loss of her being here with us all. She was/is family, but she was off to her new home. It wasn’t long before I got to visit and see her new brother – a fine little black lab male. What a pair they were and still are. This family was set, and our little angel was blessed to have them. I know she is a blessing to them as well. 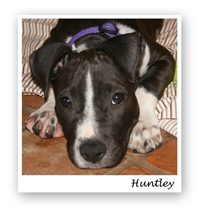 Huntley is a very happy, healthy, loved pup and that’s all we ever wanted for her. This is all for you my sweet girl! And in support of those who love pups like you.